Well, I hope you're not tired of ice cream, or ice cream cookies to be exact. 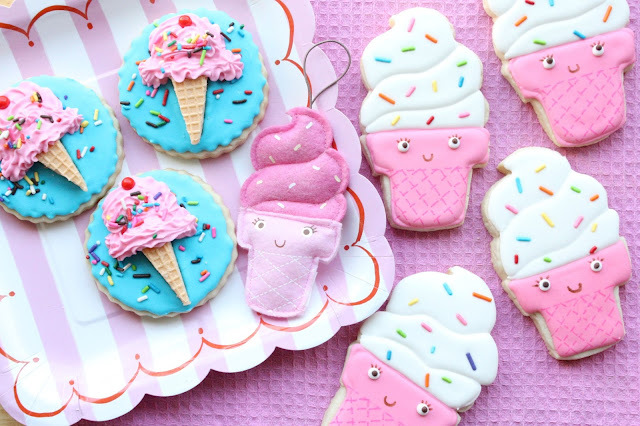 I don't think I will ever tire of making different variations of ice cream cookies. The cones on the right were inspired by the cute, felt ice cream cone ornament (in the center of the photo) I found somewhere, wish I could remember where?!? It screamed "Cookie!" to me when I spotted it. The cones on the left were from a cupcake topper design I found on the June Pfaff Daley, Art Just for Fun blog. Have a look! Simple, but so sweet. These particular cookies were sent to a young girl navigating life with a debilitating disease, ALS. In spite of her challenges, she seems to have a perpetual smile on her face, and an amazing, positive attitude! I hope she enjoyed her cookies. 1. Using an ice cream cone cutter, Roll and cut out and bake sugar cookies according to recipe. 2. Using a #3 tip, and pink tinted royal icing, outline and fill the cone part of the cookies. Let dry for about 30 minutes. 3. With the white royal icing, outline and fill the top and bottom swirl on the cone. With a tweezer (used for food), place sprinkles on the wet icing. Let dry for about 30 minutes. 4. Outline and fill the middle swirl of the ice cream cone with white royal icing. Place some sprinkles on the wet icing. 5. Add a small dot of white royal icing for the eyes and with tweezers add a cocoa pearl to each eye. 6. With a clean ruler and a pink food marker, add the broken lines on the cone. 7. With a brown food marker add the eyelashes and the smile. 1. Using tinted blue royal icing, outline and fill the round cookies. 2. While the icing is still wet, gently place the wafer cookie (cut to size, and cone shape, with a small serrated knife, in gentle, sawing motion), leaving room for the "ice cream" on top. While the icing is still wet, add the sprinkles to the blue icing. Let cookie dry for about 30 minutes. 3. Using a #18 tip (or other star tip) and pink icing (on the stiff side), apply the pink tinted royal icing to look like a scoop of ice cream. Immediately add the sprinkles to the scoop. Top with a red pearl candy. How could one ever be tired of beautiful creations like this? They are so adorable and pretty, Sue. Thanks for your comment, Jerri! Sue, these little cones are the sweetest ever! Love them! Nope not tired :) I like how you added the wafer detail to the cones with the pink pen, It's so well done. Thanks Linda! I appreciate you taking the time to comment! 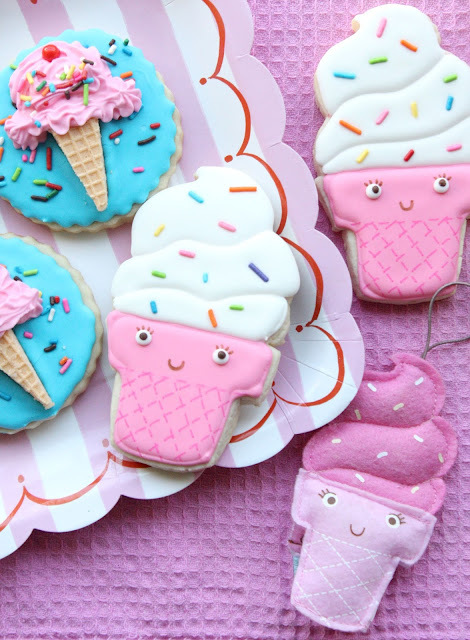 Sue, your ice cream cone cookies with the eye balls on them are so stinkin' cute! Even cuter than the ornament! Great job! These are gorgeous! How clever you are! What a gorgeous idea to send this to someone that is ill. I bet she adored them! :D I always love your ideas! Thanks for the visit and your sweet comment, Ruby! I love both versions Sue! Especially love the sugar wafer you used as the cone, such a neat idea! And you are so kind to make cookies for all the special people you come across. We have to meet in real life one of these days! Hope all is great!